We see too many headlines like Pyrethroid pesticide exposure appears to speed puberty in boys. ("Pyrethrins and pyrethroids are insecticides included in over 3,500 registered products, many of which are used widely in and around households, including on pets and in treated clothing, in mosquito control, and in agriculture," according to the EPA.) Others: Monsanto Weed Killer Roundup Faces New Doubts on Safety in Unsealed Documents and Trump's EPA undoes effort to ban pesticide linked to nervous system damage in kids. The Sierra Club is "the nation's largest and most influential grassroots environmental organization." Grassroots translates into state organizations and local chapters, into response to localized needs and opportunities. In Maryland, the Sierra Club was particularly active, as a member of the Don't Frack Maryland Coalition, in the successful fight to win a state fracking ban making permanent moratorium that was due to expire. Excellent! The Pesticide-Free Yards Campaign, which launched a few weeks back, aims individuals rather at enacting legislation. Locally, we do have protections created by the Montgomery County Healthy Lawns Act, a 2015 ban on non-essential, cosmetic lawncare pesticide use. Healthy Lawns built on the City of Takoma Park's Safe Grow Act of 2013, one of the city's many environmental sustainability initiatives. I'm proud to have helped advance both bills, but the real credit for them goes to the Safe Grow Montgomery activists, who built a broad health-environment coalition and overwhelming public support for the legislation. They demonstrated the activism's transformative power. 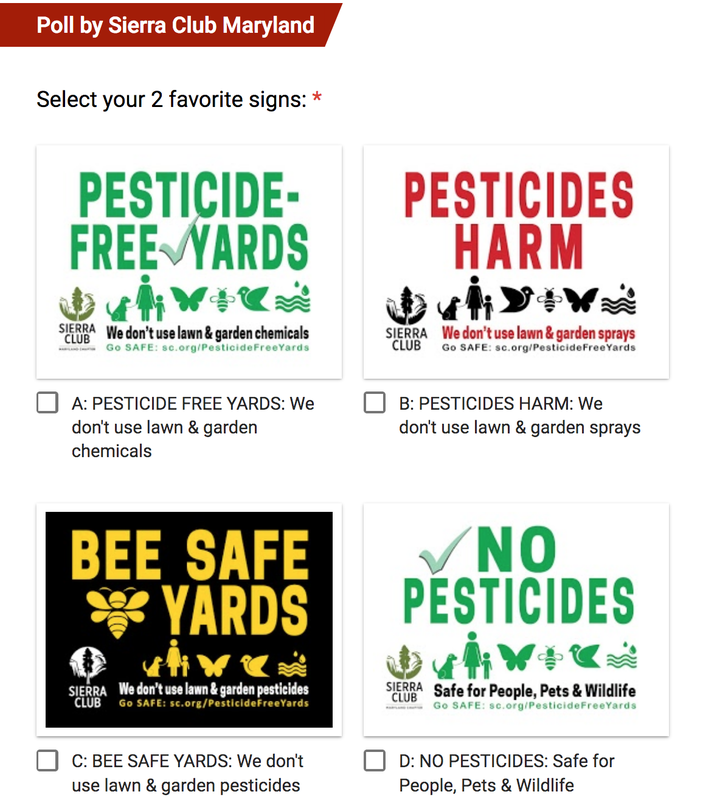 The Maryland Pesticide-Free Yards Pledge builds on the local laws. Of course, it's for all Marylanders, not just those covered by lawncare-pesticide restrictions. And signers pledge to stay away from all outdoor pesticide uses. Want to show that you're on board? Put up a yard sign! Design to-be-done. You can help choose the sign design by responding to a Sierra Club Maryland poll, open through April 12. Choices are shown below. The Trump Administration is rolling-back federal environmental policies, regulations, and international commitment – inadequate as they already were! – and proposal to cut the Environmental Protection Agency's budget by 30%. State and local environmental action – and informed personal choices – have never been more important. What about the poisons put in the bait boxes to kill rodents around the city hall?